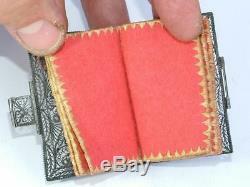 Beautiful early needle case / book in the form of a period book with clasp. 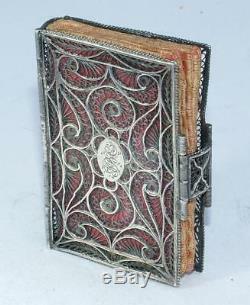 Made in fine filigree work silver. Initials to an oval boss to one side. As with many of these pieces it is not marked. The inner needle leaves are felt with worked edges. In all round good order. 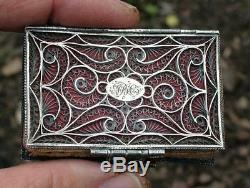 Measures 2.4" x 1.6". 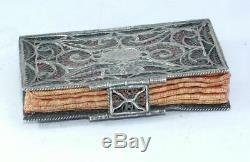 RARE ANTIQUE GEORGIAN GEORGE III PERIOD FILIGREE SILVER NEEDLE CASE / BOOK. 14,681 / PW 876. Taly, Russia, Ukraine parcels will have to be sent tracked and signed. I don't wish to exclude these countries but with so many parcels going missing this is my only course of action. Sorry there are no exceptions to the rule. Items with a weight over 2kg will be sent via courier. A telephone number will be required. High value items will have been insured and sent with tracking. Please don't be put off by these terms. Hopefully my feedback speaks for itself, but I run a business and these terms are necessary. I reserve the right to insure items in line with this policy. I will then make a claim on your behalf against the post office. No claim can be made for damaged china or glass (post office rules). FEEDBACK I will reply to any feedback given. I want to make sure you are happy so will give feedback when it is received. I try to describe all my items as accurately as possible. Some might possibly have what I consider "wear" consumate with age - slight surface blemishes, tarnishing, very small natural cracks in wood, very slight colour variations. These may not be listed in the description. Anything I feel is damage or a major detraction will be in the listing. I hope my feedback speaks for itself and my honesty in these matters. Get images that make Supersized seem small. Tailor your auctions with Auctiva's. The item "RARE ANTIQUE GEORGIAN GEORGE III PERIOD FILIGREE SILVER NEEDLE CASE / BOOK" is in sale since Sunday, May 06, 2018. This item is in the category "Collectables\Sewing, Fabric & Textiles\Needles & Cases". The seller is "1976alison" and is located in Chard. This item can be shipped to North, South, or Latin America, all countries in Europe, all countries in continental Asia, Australia.